Official Programs for the CMP National Trophy and CMP Games Matches at Camp Perry, Ohio, are now posted on the CMP website. Also, potential competitors can now sign up online via the new CMP Competitor On-Line Entry System. On the CMP web site, you can also find Official Programs for the 2008 Pistol and Rifle Small Arms Firing Schools, the 2008 National Trophy Pistol Matches and other events. Use the pull-down match menu on the CMP home page or go directly to the CMP’s National Match Index Page. Once again, the colorful First Shot Ceremony will officially open the matches. This year’s ceremony is on Monday afternoon, 7 July. The 2008 First Shot Speaker is John Sigler, President of the NRA. Other planned highlights include a military band performance, Air National Guard jet fly-by, and Army National Guard parachute jump. The ceremony, which takes place at the end of the first day of the Pistol Small Arms Firing School, will be followed by a “National Matches Visitor Reception” in the Camp Perry Club House. The 2008 National Matches will debut a new home for the air gun matches that formerly took place in a small air gun range on Commercial Row. The new Camp Perry CMP Competition Center will have 80 firing points equipped with electronic targets. The new facility will host a 60-shot air pistol event with finals on on July 13, and a special 60-shot air rifle match will be fired on the new range on July 15, along with other multi-day events. 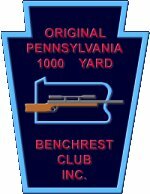 Share the post "Programs and On-line Entry System for Camp Perry Events"
From May 9-11, the Original Pennsylvania 1000 Yard club will host the nation’s first multi-day long-range benchrest school at its Williamsport range. For $200, up to 24 “students” will enjoy one night and two days of intensive training under the tutelage of some of the nations’ top 1000-yard shooters. On Friday night, May 9th, students will meet their mentors, including school director Frank Grappone, and will work on informal “homework” assignments. Saturday morning, the class moves to the range for a full day of hands-on technical training. Topics will include precision reloading, load development, gun handling, use of chronograph, analysis of shooting results, gun cleaning, and target analysis. The Williamsport Club will provide the rifles, plus all reloading components–powder, primers, and bullets. Saturday’s training sessions are followed by a steak dinner, including in the $200 seminar price. On Sunday, after an early training session covering bench set-up and match strategies, students will participate in a 1000-yard match, spending time both behind the trigger and in the pits. Instructors will explain how to read conditions, and will demonstrate target measuring and analysis after the relays. The program will wrap up before 4:00 pm on Sunday. 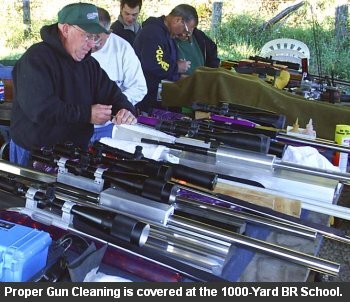 The 1000-yard Benchrest School is limited to 24 students. Gunsmiths Bruce Baer and Mark King, and many Williamsport Hall of Fame shooters will provide instruction. There should be no more than three students per advisor. Over the course of the weekend, trainees will receive 14-16 hours of quality “hands-on” instruction, plus actual match shooting time. This program is design for novice to intermediate shooters. For more information, contact School Director Frank Grappone, (517) 796-9622, frankgrappone [@] sbcglobal.net. Act soon, if you’re interested. Only a dozen or so slots are still available, and the sign-up deadline is May 1st. 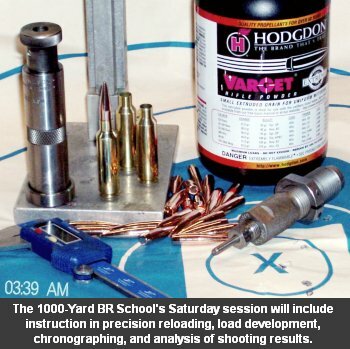 Share the post "Williamsport Hosts 1K Benchrest School"
Many of the most popular powders sold under the Hodgdon brand in the USA (including Varget and H4350) are made by ADI Ltd. in Australia. Some load manuals list ADI data, but not Hodgdon data, or vice-versa, so we’ve compiled this list of equivalent powders. If you can’t find a recommended load for a particular Hodgdon powder in your caliber, download the latest ADI Smokeless Powders Handloaders Guide, a 2.8 megabyte Acrobat file. Share the post "Hodgdon and ADI Powder Equivalents"